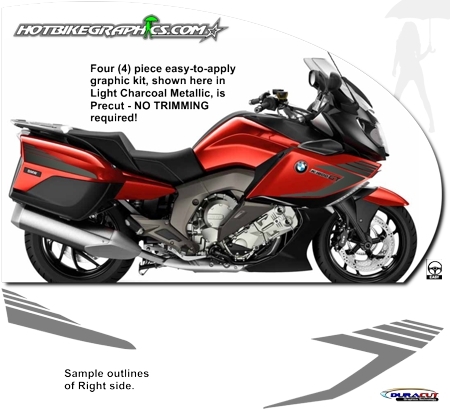 Set your BMW K 1600 GT and K 1600 GTL apart from the rest with this easy-to-apply four (4) piece Graphic kit. Created specifically for '11-Current BMW K 1600 GT or K 1600 GTL bikes, this kit will dress up your bike in no time. Available in a wide variety of colors, this kit is precut (NO TRIMMING required) and very easy to install in the areas shown. Provided with general online installation instructions and care guide. While graphic kit is stylized after factory graphics, our kit does not include the drop-shadow element that the factory graphic features. Kit provided is a one (1) color vinyl cut graphic kit. Graphic kit is bike specific and will not fit any other motorcycle.